A routine visit. An annual check-up for my rather farsighted eyes. That’s all I scheduled. Nix that. I scheduled a check-up for my soon-to-be seven-year-old too. A very pregnant mama and her three children walking in for an appointment. What could possibly go wrong? Just last week I had successfully taken my 20- month old daughter to my dentist appointment. I brought my computer, a Paw Patrol DVD, a sippy and granola bar. I plopped her in a chair, turned on the movie and she was perfectly darling. “Such a good girl,” all the hygienists cooed. Really, I’m just that great a mom! Thankfully, my eye place was prepared for us with a whole corner filled with toys. She forgot all about Paw Patrol once she spotted this awesomely awful Blue’s Clues game. “Hi, it’s Steve. I’m thinking of something in the kitchen.” Buttons and buttons of beeps, honks, and cheers, but mostly just “Hi, it’s Steve.” “Hi, it’s Steve.” “Hi, its… Hi it’s… Hi it’s Steve,” on repeat. First up, my seven-year-old. I took him just down the hall while my other two were occupied with Steve and the other toys. “Be a good listener,” I instructed as he cautiously inspected the curious machines sitting before him. “TEEG! Stop moving!” I said. Not so kindly. Finally, fifteen minutes later (at least), it was my turn. Chin down, forehead pressed, snap, snap. Pictures done. “Noo, mine!” Excusing myself, I grabbed my daughter who apparently had that annoying Blues Clues toy taken away from her by her brother, and headed back into the room filled with Star Wars eye machines. With my unwilling daughter on my lap, I pressed my forehead against another machine only to stare at a black dot with the instructions, “Click every time you see the lines flicker.” Simple enough. Except my daughter wanted the clicker in my hand. Every time I saw fuzzy lines I clicked. Every time my daughter grabbed or hit my hand, I clicked. I’m certain the results were Inconclusive. “Can we go home now?” my younger son whimpered. I finally took a good look at him. The poor boy had been sleeping or resting on the couch all morning and afternoon. His face was swollen, his skin was pale and he could barely open his eyes. Really, I’m just that great a mom! I picked him up, all 45 pounds of him, grabbed my daughter’s arm and told Teeg to come…NOW! He had conveniently managed to prop himself in the back corner of the playroom with a brother and sister from another family on either side. He, of course, had dropped one glove in one corner. Another glove in the other. Now trapped in a small, dark room, Teeg struggled through more tests; covering his eyes, coughing on the equipment and wiping his nose on his sleeve. When the eye doctor finally made her appearance, the ‘still’ word continued to be foreign to my son as he struggled to look through those super large lenses. The “which is better, one or two?” test took literally 30 minutes. Brave patience, Doctor! Then it was my turn. “Watch with your sister” I instructed my son as sternly and respectfully as I could muster. 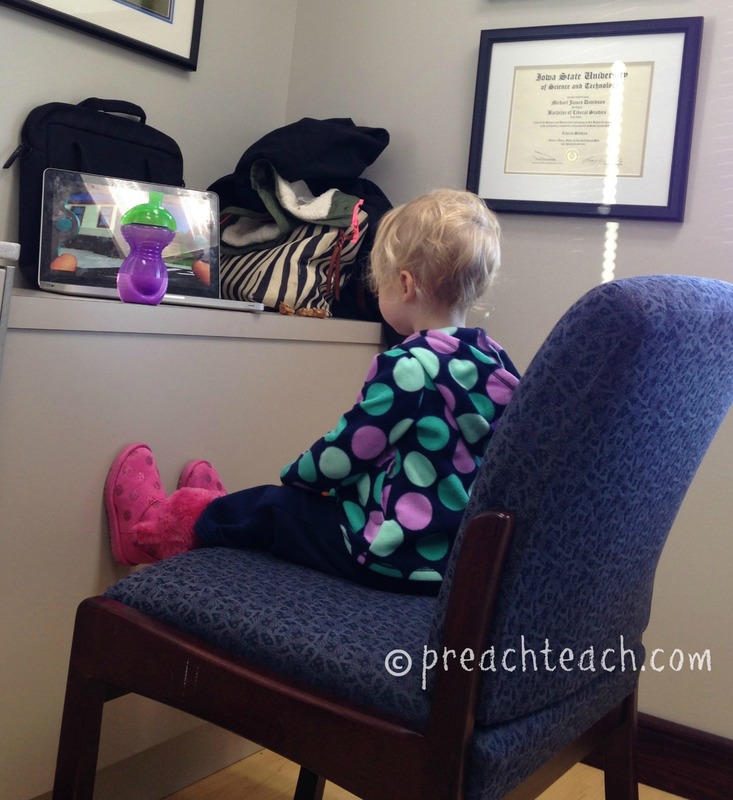 I had pulled up her favorite show on YouTube, certain it would entertain long enough for the doctor to declare my eyes were just a smidge worse than last year. Certainly this almost seven-year-old could take care of his sister while I was occupied reading tiny letters and determining if the screen above is clearer than the screen below. Pink sparkly boots flew across the room. The contents of my purse were dumped all over the floor. A screaming, flailing little girl became wet-noodlized, clearly pissed her show wasn’t working. “Someone looks like she missed nap time,” my very patient, and obviously intelligent eye doctor recognized. “Mom, I need to go to the bathroom.” Of course. Why is it that EVERY. SINGLE. TIME. I take my boys into a public place at least one of them HAS to go to the bathroom? Seriously. EVERY. SINGLE. TIME. As I sat in the exam chair with my arms clenched around my squirming, squealing daughter, I have no idea what the doctor said to me, or what letters I read. All I remember seeing through those perfectly prescribed lenses was the face of my sick little boy whose eyes were so swollen I could barely see those big brown beauties. “Almost done, baby.” I encouraged. I threw (gently) my daughter back on the floor and grabbed a paper towel only to find a volcanic rush flowing out of my son’s nose. We got him back into the exam chair and he screamed not wanting the calm, wise, fast-thinking doctor to put drops in his nose to stop the blood. I shoved a Q-tip doused in some magical ointment up my son’s nose. A roll of paper towels and a full trash can later, we had stopped the bloody nose. But this “routine” appointment was still not over. Back up front, I found a basket of Dum Dums, while I waited to pay and get my glasses cleaned and straightened as they were pretty mangled from the little hands that daily rip them off my face. My daughter ate one sucker in the time it took for me to pay my bill. She ate another in the time it took for me to get my glasses cleaned. All I scheduled was a routine, annual eye exam. What I left with was a bloody nose, tears, sticky sucker hands and crooked eyebrows. Really, I’m just that great a mom!